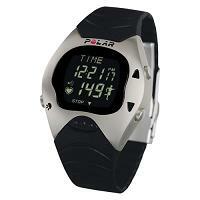 Polar M91ti heart rate monitor is designed for intermediate exercisers. It has a lightweight and stylish titanium casing and is suitable to be worn as an everyday watch. 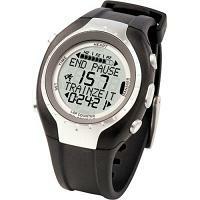 It is comparable in specs to the Polar M51/M52 heart rate monitor. Polar Fitness Test: The end result is a number called OwnIndex which gives a measure of your aerobic fitness. OwnZone: Automatic determination of your target zone based on your weight, age, gender and a test of your fitness during warm up. You can choose one of 3 OwnZone levels: basic, low and high. You can set up 2 user profiles. One for yourself and one for a family member etc. Exercise Reminder: Text message appears 3 days after your last recorded exercise. The OwnZone determination of target heart rate training limits takes into account how fit you are when you are warming up and then sets the training heart rate limits appropriately. With the M91ti, you have more control over the zone limits via choosing an OwnZone level. The OwnIndex, which you get after doing the Fitness Test, is a number comparable to VO2 max. Do it about once a month to chart the improvement in your fitness. Being able to set 2 user profiles means that you can share your heart rate monitor with a member of your family without having to change your own personal settings (weight, age, gender etc) each time. Each user also gets to keep his/her training session data. So when you are not exercising, someone else can use it. The Polar M91ti heart rate monitor is an intermediate HRM at about the same level as the Polar M51/M52 in terms of features. The main difference is the light weight and stylish titanium design. So you can wear it as an everyday watch on all kinds of occasions. Note: The M91ti model is no longer a current model, though it may still be available in some internet shops. If you are looking to buy the M91ti, maybe you can take a look at the current models Polar F6 and Polar F11.